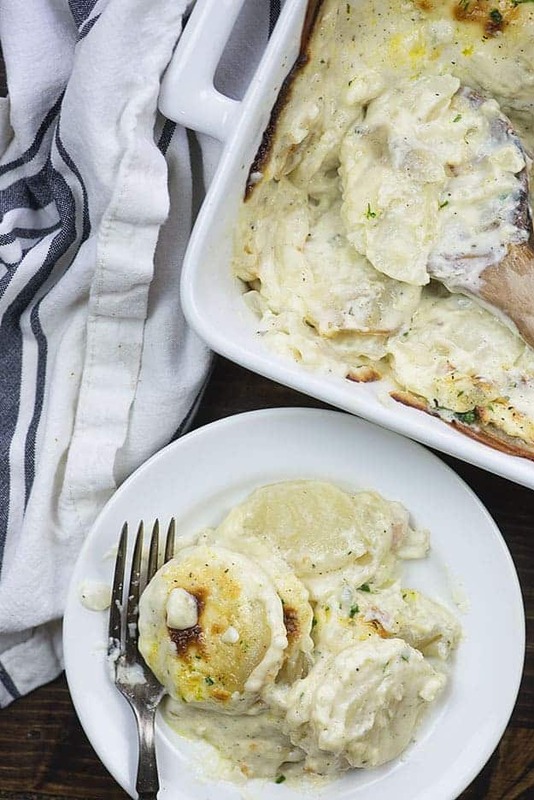 This scalloped potatoes recipe is the creamiest, most comforting dish of goodness ever. I make these for every holiday and they’re always one of the first things gone! Easter is coming up and it’s on April Fool’s Day this year. My husband thinks we should tell the kids to go find the Easter eggs in the backyard without actually hiding them. April Fool’s to them. He’s mean. But also, I’m down for that idea. 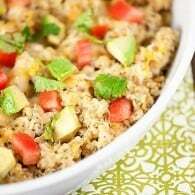 Anyway, with the holiday coming up, I had to share one of our favorite holiday side dishes with you guys. I think you’re going to love this one so much. 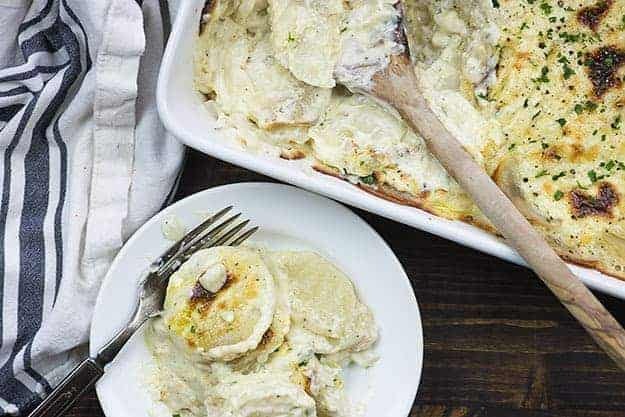 Whether you call this cheesy scalloped potatoes or potatoes au gratin, you’re going to flip over the supremely creamy sauce that is coating these potatoes. Please don’t skimp on the sauce. When you start pouring it on, it’s going to seem like overkill. You’re going to think you’ve overdone it. Let me tell you a secret: You have not overdone it. 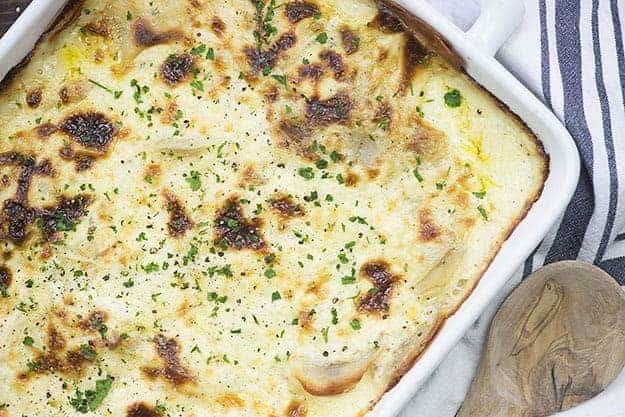 These homemade scalloped potatoes are going to be the most delicious thing on your Easter plate, I can almost guarantee it. 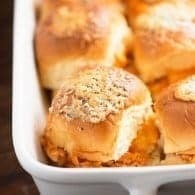 Make them alongside my Jiffy corn casserole with my homemade brownies for dessert. 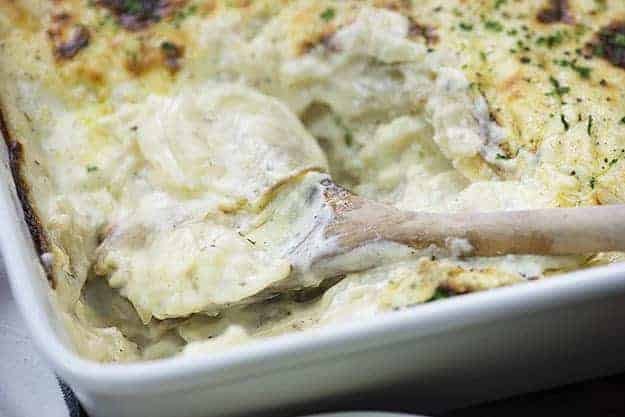 These cheesy scalloped potatoes are great at holiday dinners, but they also go great with my turkey meatloaf. I like to start with the white cheddar cheese sauce. This cheese sauce is totally simple and oh so creamy! You’re going to want to eat it with a spoon. You’ll start by making a roux – this just means that you’ll melt some butter, stir in some flour, and whisk in milk and cream until everything starts to thicken up. I add onions to this recipe so I cook them with the butter for a few minutes before adding the flour. I like them nice and soft. Normally, we’d just remove the roux from the heat and stir in some grated cheese, but we’re not stopping there today. We want these potatoes to be extra creamy and delicious. After you stir in the cheese and get the sauce nice and smooth, you’re going to add a can of cream of chicken soup (just trust me on this) and some sour cream. The creaminess of this cheese sauce is out of this world. 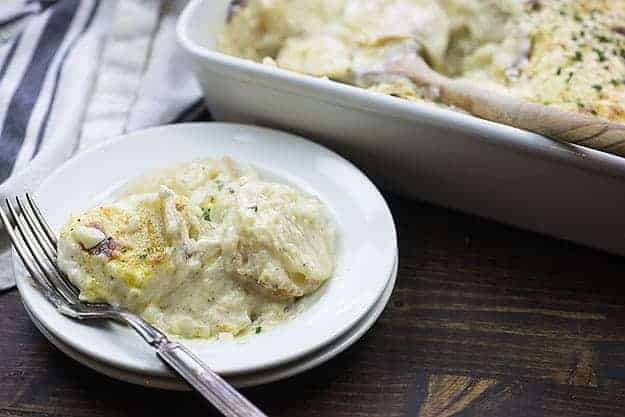 White cheddar normally has a bit of a bite to it, but it mellows out really nicely with all of the creamy goodness going on in this sauce. Once the cheese sauce is made, just set it aside and get started on the potatoes. We’re doing the cheese sauce first, becuase the potatoes turn brown fairly quick after slicing and nobody likes the looks of that. You’ll need a whole lot of Idaho potatoes. Wash them and peel them. Now, if you have a food processor, put it to work. Use the slicer attachment and slice your potatoes into thin slices, about 1/8 of an inch thick. 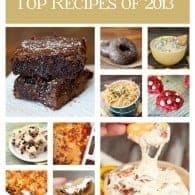 I use my Breville Sous Chef food processor (affiliate link) for this. It’s a total workhouse and gets the whole batch of potatoes done in about a minute. Easy peasy. Your second option is to use a mandoline. This one has great reviews. (Also an affiliate link) This method will take a little longer, but you’ll get even slices in a fairly short amount of time. And, last, is a knife. Obviously, this option is going to take the longest, because you’re slicing the potatoes THIN and EVEN. But, if you don’t have a food processor or mandoline, this is the only way to go. Spray a 9×13 baking dish with non-stick spray and place half of the potatoes in the dish. It’ll be a nice thick layer of potatoes. Top with half of the cheese sauce. Now, I know that it seems like a LOT of cheese sauce. That’s because it is. Just trust me. Repeat the layers and then cover the dish with foil and bake for 30 minutes. You’ll take the foil off and keep baking for another 45 minutes or so. We want those potatoes nice and tender and the cheese sauce good and bubbly. You won’t even be able to handle the goodness that comes out of your oven. Just you wait. If you’re looking for a low carb side dish, try this cauliflower potato salad! There’s bacon and cheddar involved, so you know it’s good. 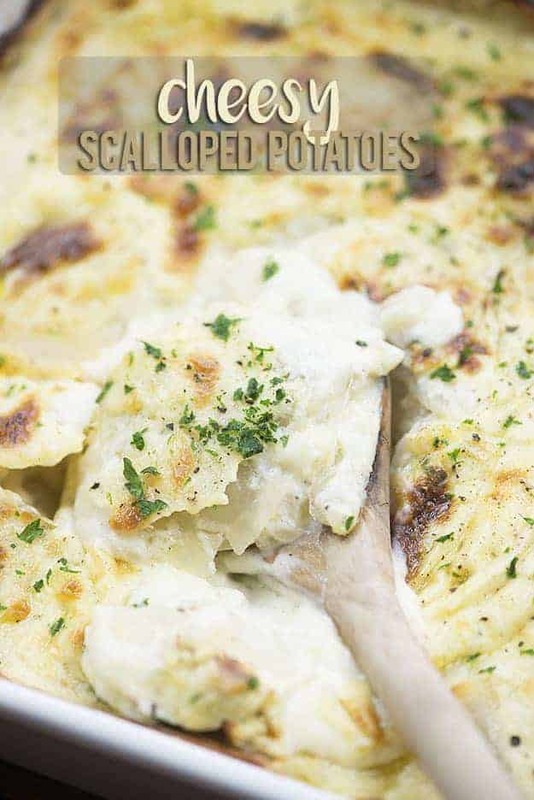 Let me know if you try this scalloped potatoes recipe! I can’t wait to hear what you think! 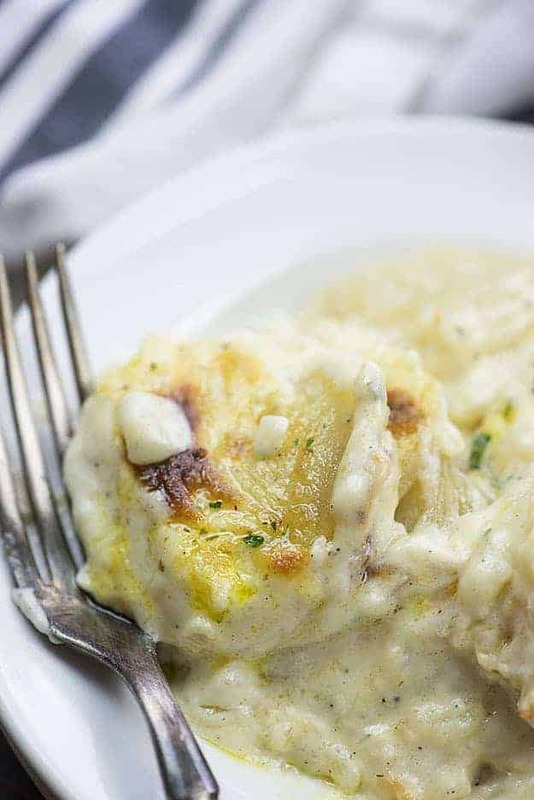 These cheesy scalloped potatoes are coated in the thickest, creamiest cheese sauce. This is pure comfort food! Add the butter to a large sauce pan over medium heat and melt. Stir in the onions and cook until beginning to soften, about 5 minutes. Sprinkle the flour over the onions and cook, stirring constantly, for 1 minute. Pour in the milk and cream while whisking the mixture constantly. 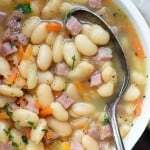 Continue cooking over medium heat, whisking constantly, until mixture begins to thicken, about 3 minutes. Remove from the heat and stir in the grated cheddar. Stir until cheese has melted and mixture is smooth. 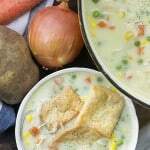 Stir in the cream of chicken soup, sour cream, salt, parsley, and pepper until combined. Place half of the potatoes in a thick layer in the prepared 9x13. Pour half of the cheese sauce over the top. Repeat the layers. Remove the foil carefully and continue baking for 45 minutes or until potatoes are soft. One year, when I was a child, we heard some banging on the back door. We found a note from the Easter Bunny that said, “I’ve hidden a dozen eggs in your backyard. Happy Easter!” It took us about 20 minutes to find the first 11 eggs but we couldn’t find the last one! Even with the dogs helping, we couldn’t locate that last egg. We hunted for hours with no luck. Finally, the neighbor lady next door took pity on us and told us that her husband had only hidden 11 eggs. He was in his house watching us and rolling on the floor laughing! A quaint little story, but I fail to see how this relates in ANY way, to the recipe presented! It actually does relate to the blog post if you read it. That said, I’m not sure why you’d take the time to comment negatively on something another reader said. If you don’t like it, just move on. The recipe was in NO WAY connected to ANYTHING relating to an Easter Egg hunt. I took the time to comment b/c some readers, like yourself, use a recipe comment section to vent about any and everything, EXCEPT… the topic at hand. I’m all for readers’ comments on how their preparation of the recipe presented, turned out. That said… have a nice day. Sounds like someone needs to sing a Christmas carol. Or an Easter carol. Not a scallop spud fan, sooooo…just one further word: CARNITAS!!!! This tastes great,but next time I make it I will add a little more flour because l like sauce a little thicker. This was too juicy but delicious. Thank you and please keep cooking. 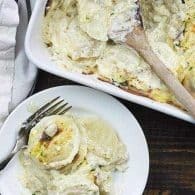 What is the difference between Au Gratin and Scalloped potatoes ? Keep telling stories to.